It's festival time again! Thanks to Amy, of Amy's Creative Side, for once again hosting this fun event for us bloggers. I'm looking forward to seeing the quilts that the rest of you have chosen to enter. The festival link-up will be open until October 31, so you still have time to put together a blog post if you haven't already. My festival quilt this year is one that I completed recently, and have recently posted about, but for those of you visiting my blog for the first time, this will be new to you! Thank you for visiting, and I hope that you will stay and take a look around. This quilt is currently listed in my shop. This baby quilt is one of my own design. Some of my favourite fabric lines are the ones put out by the Sweetwater girls, and for this quilt I used my very last pieces of Hometown, and some of my last bits of Reunion as well. I used a tutorial by Badskirt Amy for the quick and easy circles. This was a first for me, and was a lot of fun. I played around with the arrangement of the circles, on the backdrop of Kona Bone, and finally decided on this layout. Then, I machine stitched the circles to the background fabric. Next came the decision on how I would quilt this project. I've recently been learning how to free motion quilt and knew that I would want to try a new design on this quilt, especially given how much negative space I had to work with. I found this 'crybaby meander' design via Pinterest (video tutorial here) and when practicing I found it to be a design that flowed easily and was fairly quick to do. I decided to quilt around the circles, which proved to be a more challenging task than I thought it would be, but in the end I was so happy with the result and the extra effort was worth it! For the back, I found this really sweet tiny floral fabric that coordinated so well with the Sweetwater prints, and I planned to just do a plain back. As luck would have it, the piece I bought was not quite long enough, so I ended up piecing it with some of the Reunion pennant prints, and I love it. Adds an extra little touch that I think is a lot of fun. 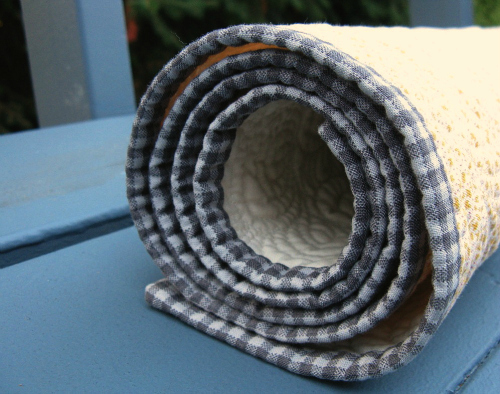 I chose to bind the quilt with some gray gingham fabric I had leftover from the backing of another project. It goes so well with the esthetic of the Sweetwater fabrics. It's also gender neutral, and I think this quilt would be well suited to a baby boy or a baby girl. Finished size: 32" x 40"
Your quilt is SO pretty! The FMQing is gorgeous and gives it so much movement! I also think it was worth the extra trouble to quilt around the circles. Great job! I'm still just so impress with your quilting here, Heather! And I think the back and binding just suit this quilt to a "t!" wow, Heather!!! Your quilting is stunning! What a pretty quilt! Just love this quilt - so beautiful with such fabulous quilting! I'm very impressed with this whole thing! You went from unsure on FMQ to doing an AWESOME job on a huge amount of quilt to cover! And of course, I still love the pennants on the back. The quilting is amazing Heather!! I love the quilt..and great job on the FMQ!! Great job on the circles! Thanks for the link to that tutorial. I love the design and the quilting is amazing! Thanks for sharing it! Gorgeous Heather! the quilting is amazing! The quilting on this still amazes me! i'd forgotten how impressive the quilting was on this, i'm glad i got to see it again. you're such a rock star! So gorgeous, Heather! 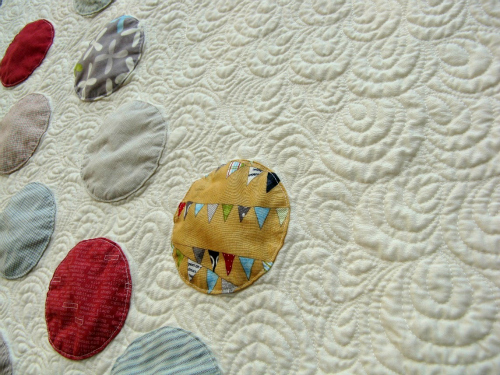 I just love your quilting in all that beautiful negative space! I am so glad you picked this one for BQF. The quilting is so divine with those circles. Gosh..I love this still! I don't think I saw this one!! I love it. Obviously you've got your new machine rocking the FMQing because it looks amazing. Well done you!!! The quilting is amazing!! Great job! Beautiful. You did a great job on this. The quilting on this one is just beautiful! Beautiful quilt! And your quilting looks fantastic! 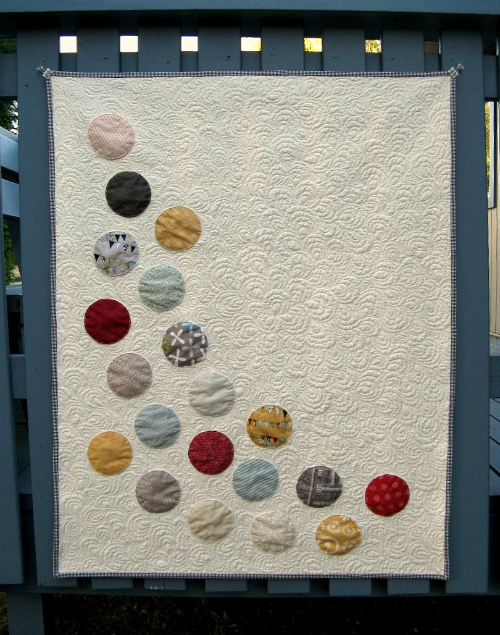 Love the simplicity of this quilt. Your qilting is fantastic and gives the qilt sch movement. Beautiful quilt - your FMQ is really stunning! Such a great quilt. I love everything about it, down to the binding. Your FMQ looks terrific. The simple design, allows for a great showcase of beautiful fabrics, and fabulous quilting. What a winner! WOW! I love the way you free motion quilted this. Thanks for the link. I am just learned to FMQ so I will check it out. Wow - your quilting is incredible! I like everything about this quilt - the design and the fabrics you chose! This is so beautiful Heather, the design, the quilting, everything. Love it. Such a pretty quilt! 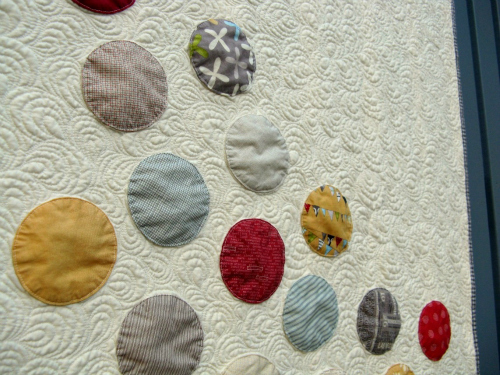 Love how the circles pop with how you quilted it. I like your quilt ! Yay, I'm so glad you entered this one! I love how you took a simple idea and really made it shine. The quilting really is the star of the show and looks amazing! 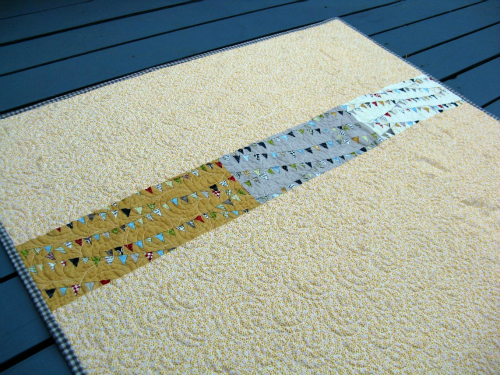 i love the simplicity of this quilt - makes it so chic and the quilting makes it pop. Great job. Very cool quilt girlie!! Love that sweetwater fabric too!! One of my favs!